KISMAYO, Somalia - African Union Mission in Somalia (AMISOM) and the United Nations have handed over a new police headquarters and a vehicle to Jubbaland state to help boost security in the region. Speaking at the ceremony, held Monday, Jubbaland Police Commissioner Ahmednasir Guled Hassan commended the support provided by AMISOM and the United Nations Office for Project Support (UNOPS) describing it as a positive gesture. 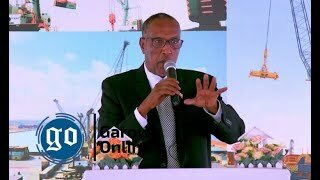 Mr. Hassan said the ceremony to open the new office block and the donation of the vehicle was a testimony to the harmonious working relationship between the Somali government, donor community, the UN, and AMISOM. “We work with UN and AMISOM, they train our forces, they trained most of the officers in this headquarters and they are training more. 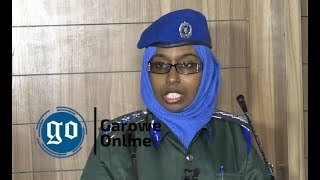 We have a good working relationship,” the Jubbaland Police Commissioner added. “We are in a country that was in a civil war for thirty years. 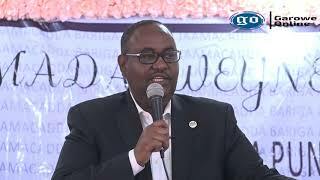 We, therefore, request for your support so that we realize a Somalia that can stand on its feet and become self-sufficient,” Mr. Abdikadir noted. “Today we are here to show solidarity with our partners, especially UNOPS that specifically put up this building,” said Ms. Alalo. The Deputy Police Commissioner observed that officers need proper office accommodation to enable them to perform their duties effectively. 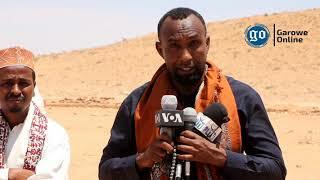 “This is a wonderful facility given to the police force; it will really help the Jubbaland authority and Somali government to bring peace, security, and stability to the region. 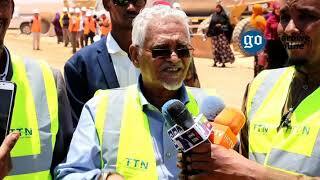 I hope this facility will be useful for the people of Jubbaland and Somalia,” Kabir noted.